The Trost District (トロスト区 Torosuto-ku?) is a town located on the south edge of Wall Rose. 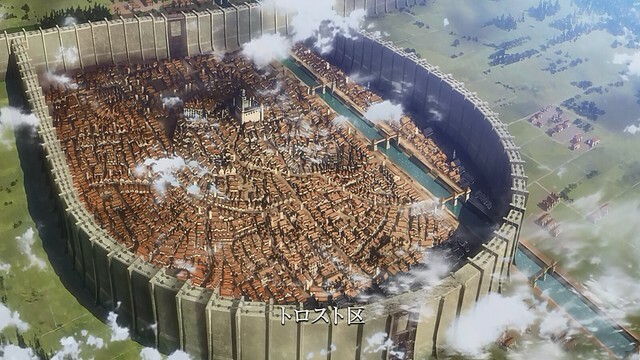 Because Trost is the town closest to the breach in Wall Maria, it is the town that most frequently comes under attack from Titans. It was a fine day in the Trost District. Perhaps a little bit more crowded than usual but Robert didn’t mind that. He was there to send a letter to his higher-ups in Marley. He walked towards the first postbox he could see as he took his letter from his uniform. Before he could finally place the envelope he was holding inside, he sensed the presence of another person behind him. Quickly pushing the envelope through the opening of the box, he turned around. It was none other than Gero, walking towards him. “What are you doing Rob?” he asked, calmly. His tone indicated that he had indeed seen what Robert had done. The question was more of a rhetorical one. “I uh… I am sending these reports.” replied the blond man, lying. Even though his voice had wavered at first due to this unexpected confrontation, he had managed to keep his cool and lie properly. “Which reports?” asked Gero again, not letting his comrade catch a breath. “The ones for the 62nd expedition.” answered Robert. The Survey Corps Commander hadn’t required any reports from them in a while, so the best lie to follow was to say that he was simply sending a report he had forgot about. As he was about to begin explaining, Robert’s senses were alerted once more. It was as if there was something he kept missing. Something that he needed to realize but failed to. “I had the reports of the 62nd expedition collectively sent and processed two days ago.” Gero’s words pierced through the blond man’s heart, inducing surprise. With the help of the adrenaline surging through his body, Robert also found out what he was trying to see all along: the streets were empty. It was quite crowded several minutes ago when he had arrived, but now there were literally no people on the streets. Trying not to be affected by this sudden and incredibly silent evacuation, he continued. “Henchou, what are you talking about? I never-” Though he was cut off in the middle of his sentence. “I know, Rob. I have known it for a while. You are the reason why Marley knows every step we take. You, are the one who leaks our information.” Following this sentence, Gero quickly and mercilessly unleashed one of his blades and swung it. Though he stopped his hand right before it could make contact with Robert’s neck. “Not even a flinch, eh? That’s not how a mortal man reacts to such a lethal move. Am I wrong Rob? Or should I say, the Jaw Titan?” Just as he had feared before, the cunning side of his captain had found his secret out. Perhaps even his absence during the sightings of the Jaw Titan hadn’t gone unnoticed. That was it for him. His cover had been blown. There was nothing to hide anymore. Knowing this, surprisingly, brought him joy and relaxation. So much so that he started to laugh. “So what? I wanted to rid this world of you devils. I was bestowed upon great power for that very purpose. I was specially trained for infiltration anyway, all I had to do was to pretend.” he said once he was done laughing. Slowly moving his left hand, he grabbed Gero’s blade. “From now on, it seems like my mission is over. But, there is one more thing I want to do before I go back.” All of a sudden, Robert pushed the blade against his neck and started to bleed heavily. “I’ll... massacre the Survey Corps. And I’ll... start with you.” Knowing what was about to happen, Gero used his 3DM gear to leap away. As he increased the distance in-between significantly, Robert transformed into the Jaw Titan. Unlike regular Titan’s, Robert’s 5m-class Jaw Titan had specially hardened skin instead of normal lips, and armored fingers and knuckles. He wasn’t intending to give any time to his Captain to react. As Robert carried on trying to slash Gero into pieces, the latter used his 3DM to move around Robert. “You made two miscalculations.” Mumbled Gero as he attached one of his hooks on the ground and pulled himself towards it. At the same time Robert’s Titan leapt towards him but Gero managed to dodge his attack by using his gas to propel himself in the opposite direction. As he passed by, he used his sword in his right hand in a reverse grip and severed the tendons Jaw Titan’s right leg. “First you told me you were specially trained, meaning you currently possess information that is confidential to regular Marleyan soldiers.” he said as he landed. This meant that Gero was originally planning to take Robert as a prisoner. But now that he knew that he possessed classified information, he didn’t want to risk it. As the Jaw Titan tried to move with his remaining leg, Gero attached his 3DM gear’s hook to it. Without losing any time or momentum, he pulled himself towards the other leg. Though he managed to sever the tendons again, the Jaw Titan also managed to impale him with one of his fingers. “Second, you assumed you could kill me.” He said as he flew right in front of the Jaw Titan’s head. A small spark flickered inside his eyes, causing the Titan to open its eyes widely in shock. With a smile, Gero released the gas from his 3DM gear and flew upward. Then a huge amount of electrical discharge was released as waves. Finally, Gero had transformed into the Attack Titan. With a fearless roar he landed on top of the Jaw Titan. The latter tried to struggle and break free of his control, which angered Gero. He quickly ripped the arms of the Jaw and tossed them away as if they were nothing. Roaring one last time, the Attack Titan opened its mouth widely and bit down on the Jaw Titan’s neck. It bit so hard that the entire spine came out when he moved his head back. And along the spine came Robert, barely conscious. The last thing he could see would be being eaten by the Attack Titan. Once Gero was done eating him, he looked at his hands. He could crystallize his nails now, which looked much sharper than his regular hardening. Additionally, when he willed it his teeth sharpened too. Knowing he had indeed gained the power of the Jaw Titan, he emerged from his Titan’s body. “He could have been so much more. What a waste.” he thought as he received Robert’s memories as well. Using his 3DM gear, he quickly moved away and made his way towards the Survey Corps HQ.